Infinity Pipe Systems staff are committed to assisting customers through our products to find the best solution to suit their needs, drawing upon our collective technical knowledge and industry experience. 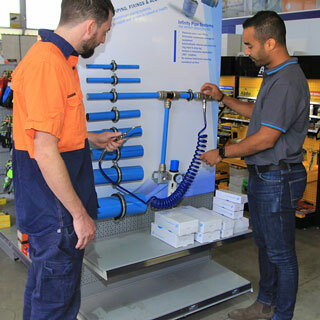 Infinity Pipe Systems provide a fully integrated turnkey solution, boasting a team of some of the most experienced designers and technicians in the Australian and New Zealand pneumatic industry. Infinity Pipe Systems is unique in that we hold the technical knowledge, industry experience and product innovation that enables us to offer an all-encompassing package. From the supply of leading-edge compressed air equipment. To the consultation, design and installation of highly efficient leak-free systems. We provide products and services for large-scale projects within a wide range of industries. With past clients including Coca Cola, Fonterra, Goodman Fielder and Cameron. With a vast range of products including aluminium pipe, filtration, fittings, valves, cylinders and tubing. We have the versatility to ensure you have the most efficient compressed air solution. Our aim is to bring our customers technical expertise, superior workmanship across all sized projects and unlimited access to the most advanced pneumatic equipment on the market. Our dedicated, professional design engineers are available to provide advice on any pneumatic project. If you would like more information, contact our friendly team on 1300 272 982 or email us at info@infinitypipesystems.com.au. Originating from Bione, Italy, Infinity Pipe Systems was developed in 2004 by Aignep, a multinational producer of compressed air products. In 2005, Pneumatics Direct brought the range to Australia, making it available to customers through their nation-wide distribution network. Infinity pipe Systems is a high performance aluminium piping system that is easy to install and simple to extend or modify. The non–corrosive extruded aluminium provides structural strength and delivers contaminate-free fluid in a leak free piping system. 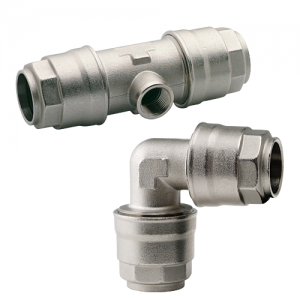 The smooth bore of Infinity piping prevents high pressure losses and allows for higher flow rates. Consequently, this accounts for a higher performance than that of any other system. No fluid leakage ensures minimum running costs. The standard products used in the industry for years have been galvanised steel and plastic piping systems. However most noteworthy these systems may be costing you a lot more than you realise. Galvanised pipe corrodes on the inside where it can’t be seen, therefore reducing flow and increasing pressure drop. On the other hand plastic, if not bracketed correctly will sag and bow, creating potential condensate collection points. Infinity Pipe Systems offers the first all metal piping system, specifically designed with energy savings in mind. It’s extremely smooth corrosion-free pipe, complimented with easy install fittings and our patented zero condensate tee. All together it keeps the fluid flow laminar; therefore reducing turbulence, minimising pressure drop, and removing condensation. The high quality standard set by the Infinity Pipe Systems also means that it is ideal for air, vacuum and nitrogen. Pipe is available in a selection of colours to meet the required regulations.